The famous statue of Helios, the Greek God of Sun, has been removed for renovation before it returns to pride of place at the redevelopment at Television Centre later this year. Developer Stanhope and construction manager Mace have carefully removed the gilded bronze figure with heritage experts PAYE Conservation for repair and renovation. The Helios has stood in the rotunda at Television Centre since the former BBC headquarters opened in 1960. 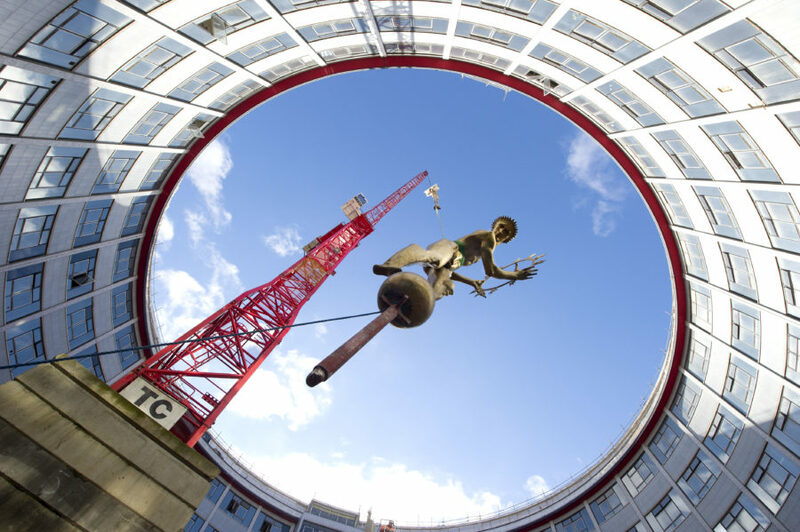 The Helios courtyard will be remodelled by architects AHMM and the statue will once again form the centrepiece of Television Centre. The redevelopment will provide 950 new homes – with 432 in the first phase - 500,000 sq ft of office space, a new Soho House club and hotel, as well as restaurants and cafes. The BBC will return to three refurbished studios in Spring 2017 and BBC Worldwide completed their move to the site in March 2015, with over 1,200 people in their new headquarters on Wood Lane. “Television Centre is a British icon and the Helios statue is synonymous with this famous building. It will be a very special moment for everyone involved with the project when Helios is returned, as part of the renovated inner courtyard. “The BBC’s heritage has a vital role to play in the future of Television Centre and we will also be retaining the iconic Television Centre atomic dots, the John Piper mural and the cantilever staircase – as well as the beloved Blue Peter mural – which are all integral to what we are creating at Television Centre.